“He’s spoken on the “Jewish question” and Jewish IQ numerous times, so I’m hoping to ask him some questions about that. Specifically, I’m interested in how long he’s considered the “question,” why he addresses it as he does, and what he sees as the pitfalls of engaging in the question. He can be available by phone as well if you are interested. What accounts for your fascination with Adolph Hitler? Have you ever said, or would you be willing to say, that what Hitler did — in terms of beginning, orchestrating and insisting on the organized extermination of European Jews — was morally wrong? Do you believe that Jews are wrongly accused for being the root of many current societal problems in the West? When it comes to groups like Identity Evropa or Hungarian far-right groups, are Jews a scapegoat or a justifiable, objective source of economic and cultural decline? Do you believe Jews are primarily responsible for the spread of Marxist theory in the West? Do you believe that it is undesirable for Jews to occupy, as you guesstimated, about 40% of the positions of extreme wealth and influence in the world? Is it undesirable for Jewish culture to have such powerful disseminators? Do you believe it is possible to reasonably determine why the Holocaust came about? If so, what’s your answer? These questions, as a set, are basically of the “have you stopped beating your wife” genre: that is, designed to imply that there is very good reason to believe that the person answering does in fact hold the views in question. 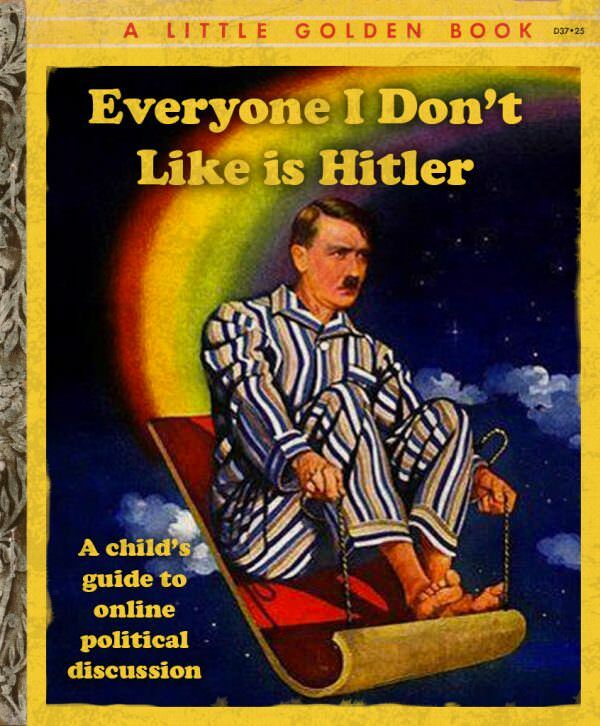 That’s particularly true of the first two: “what accounts for your ‘fascination’ with Adolph Hitler?” (as opposed to, for example, “your undying hatred of and contempt for Hitler,” and “have you ever said, or would you be willing to say, that what Hitler did…. was morally wrong?” which is absolutely laced with implicit innuendo. However, Ari Feldman, the journalist in question, had assured Rob (the publicist) that he was writing a piece of genuine inquiry, rather than something pre-written from the beginning, and I thought (given the audience of Forward) that I might be able to address the idiot accusations of anti-Semitism that have sporadically been aimed at me, despite almost thirty years of lecturing and teaching about the horrors of the Holocaust (see, for example, Chapter 5.2.2. of my first book, Maps of Meaning, entitled The Adversary In Action: A Twentieth Century Allegory, which is devoted to an analysis both of the evils of the Nazi death camps and the Soviet Gulag Archipelago. Maps of Meaning itself is in fact devoted entirely to an analysis of the psychological motivations underlying acts of atrocity in the service of group identity, particularly of the ideological type). So I talked with Feldman. I wouldn’t say the conversation went smoothly. He adopted the kind of accusatory stance that might have been expected from the tone of his original questions, acting and reacting as if I had something to hide, or wasn’t saying what I really thought, whenever he questioned me about my work on the psychology of the Nazis. I hate conversations of that sort, where guilt is assumed on the part of the interlocutor, and innocence has to be proved. However, by the end of the conversation, I thought we were having a genuine discussion, and that Feldman has quit playing cat-and-mouse. Rob Greenwald, who was listening to the call, agreed. There was still trouble lurking in that: For example: “I think the story will balance the comments he’s made in public” (what comments, precisely, Mr. Feldman? More innuendo) and even “certainly what he told in conversation is much more nuanced that what exists for public record” (precisely what ‘public record,’ Mr. Feldman? Here’s a lecture on evil and tragedy. “Dr. Peterson, a couple follow-up questions, if you’re able. My deadline is 4 pm. Thanks! First, you have said that the feminization of men in the West is responsible for the rise of anti-democratic politicians and political movements. Would you say the same is responsible for the uptick in anti-Semitism over the past five to ten years? No: I said that attempts to force the feminization of men would lead to an aggressive, fascist backlash. Not the feminization of men. The attempts to force the feminization. It’s not the same thing. Second, you told me that it’s difficult to know why the Holocaust happened, because we don’t know a lot about the psychology of ordinary Germans who participated in the Nazi regime. How important do you think is anti-Semitism to explaining the origins and extent of the Holocaust? Third, you called the “jewish question” a “hornets’ nest.” And yet, you kicked it, after, as you said, being accused of not having sufficient courage to address the “question.” Do you feel that by answering the question you were modeling “courage” for your fans/watchers/readers? “Hi, Dr. Peterson, another follow-up for you (would also be great to hear back on that question above). You now have a very large following, and your lectures and ideas are reaching millions of people. In your teaching about the Holocaust, and in trying to derive lessons from it, you play up the importance of individual responsibility, and you have said little about the role that anti-Semitism played in beginning and fueling the Holocaust. You frequently condemn “radical leftist” movements, and your followers are presumably very aware of your aversion to Marxism. Do you think that it is your responsibility to be as loudly opposed to fascism, anti-Semitism and white supremacy as you are toward “radical leftist” movements and ideas? Ari, if you watched my videos and were familiar with their content you would know that this is a foregone conclusion. I have been lecturing about the dangers of fascism and it’s attendant antisemitism for almost four decades at two great universities and on public TV in Canada, not to mention writing two books relevant to the topic and producing the videos that have been viewed by millions of people. In fact I might point out that few people in recent times have managed to bring the catastrophes of the Holocaust more clearly into public view. Have you read the influential Jewish author and journalist Norman Doidge’s intro to my book? With regard to the radical left: The overwhelming leftist bias in universities has been well documented by neutral and reliable observers such as Jonathan Haidt. Since I’ve been concerned with the detrimental effect of such an imbalance on the campuses and consequently on society at large and since there is absolutely no equivalent threat in that sphere from the right (and given that I am, after all, a university professor) then it makes perfect sense for me to focus on the radical left. There are zero university courses teaching right wing activism and 100s of such courses performing that service for the radical left. Given the catastrophic excesses of the radical left in the 20th century I think that is due cause for concern. Your questions are predicated on your oft implied assumption that there is something sketchy going on with regards to my views and the radical right. There isn’t. It can’t be more well documented than it is. It is in the best interest of the radical leftists to paint me as unreasonable and extreme because that’s the simplest way to deflect my perfectly relevant criticisms. But it’s completely and utterly unwarranted. It’s not only false. It’s actually opposite to the truth. “Thanks for this response Dr. Peterson. I hope you understand that I am asking these questions precisely because I want to get as specific as possible about what you believe. You write above that “there is absolutely no equivalent threat in that sphere from the right.” Does “that sphere” refer to society at large or campuses? Furthermore, the browser tab read “Hitler” (something built with intent into the underlying code of the article) … and the indexing terms? Peterson’s willingness to answer questions about “Jewish success” and his interest in IQ literature is “suspicious” said Deborah Lipstadt, a professor of history at Emory University and author of “Denying the Holocaust,” who won a libel case in Britain against prominent Holocaust denier David Irving. Lipstadt said that Peterson’s statements on Jewish intelligence reminded her of Kevin MacDonald, a professor of psychology who the Southern Poverty Law Center has described as “the neo-Nazi movement’s favorite academic.” MacDonald has written several books criticizing Jewish intellectual culture. (Peterson links to a critique of one of MacDonald’s books at the end of his blog post on Jewish intelligence.) Lipstadt said that MacDonald’s academic language obscures the anti-Semitism behind his opinions. She worries the same is true of Peterson. “It’s not [Holocaust] denial, but when people start asking questions like that, I begin to get leery,” Lipstadt said. “The question is, is he a self-help guru who find the Holocaust a convenient way of attracting attention, or is there serious thought going on here? 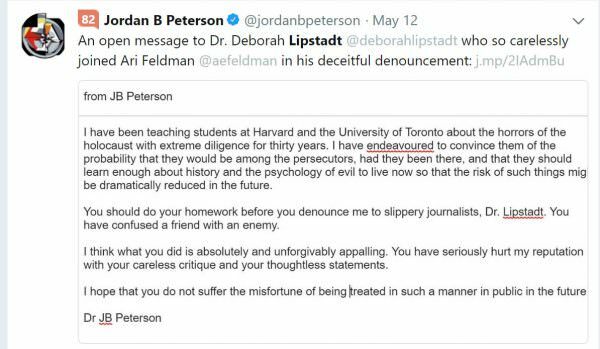 Likewise, Lipstadt wonders why Peterson rarely mentions anti-Semitism in his work on the Holocaust. Peterson more often attributes the cause of the Holocaust to human nature. “Anyone who really diminishes the importance of anti-Semitism — who says, ‘Oh it was an afterthought, a cover’ — I think has got it wrong,” she said. And have heard precisely nothing in reply. It’s taking every bit of self control I have right now not to go after him right now. He’s put up a picture of HItler next to me, for Christ’s sake. And the tab that marks the URL on Chrome has “Hitler” as part of the tag. This is not acceptable. Upon reading it I was upset because I was also decieved. This was not the direction this article was to to go. It TRIES to paint you as a holocaust denier which anyone who has listened to you at all would know is the complete opposite. I asked [Feldman] if he had read your work and he said he had done a lot of research and would continue to do so between our correspondence and your interview. Even if he actually did, he had this article already in his mind and there is no way we could have known. This rarely happens but it does still occur and no amount of vetting can prevent it if the author is being untruthful. I’m speaking to the journalist as soon as he is available. I’ve read the comment and the article is being torn apart. Its poor journalism. “You dare to thank me, and then put up an article online placing a picture of me beside a picture of Hitler? 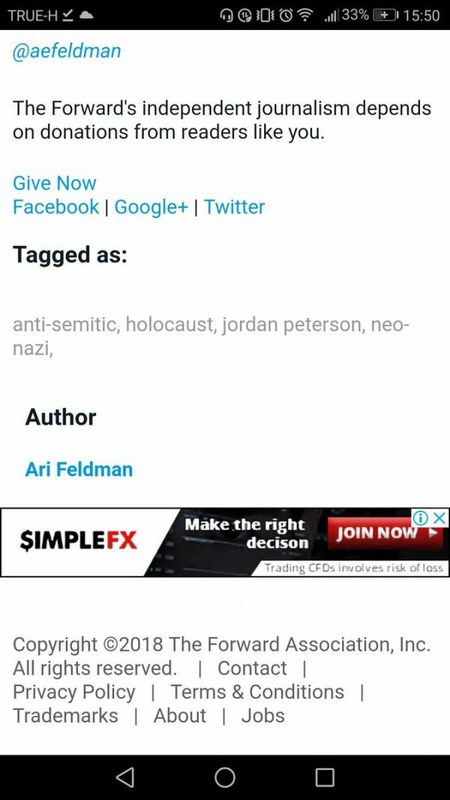 With the title of “Is Jordan Peterson enabling Jew Hatred?” With a Chrome URL tag with Hitler’s name beside mine? And to say this: ” Jordan Peterson is a public intellectual adored by neo-Nazis, white supremacists and conspiracy theorists.” ? Here’s something to chew on. Perhaps I don’t mention anti-Semitism enough for you because I don’t think that the casual term “anti-Semitism” is sufficient explanation. It’s a description, you see, not an explanation (and certainly not one with any psychological or philosophical depth). What is the cause of anti-Semitism? That’s what I have been trying to understand (that, and how to prevent it). Because the reason for “anti-Semitism” is by no means obvious. Or perhaps it is to you and the sanctimonious “authorities of far right studies” you chose to consult. But it’s not obvious to me, and that’s what I have been studying all these decades. Why was there anti-Semitic sentiment, sufficient to drive, for example, the actions of the Nazis? Was that somehow different than other common forms of murderous tribal outgroup prejudice? Do you think that someone has sufficiently answered such questions? Point them out. I’d be happy to learn. You confuse my attempts to answer such questions with ignoring anti-Semitism (although, of course, you don’t offer anything but appalling and libelous innuendo to suggest why I might be motivated to do such a thing). I still can’t believe you crafted such an article, and that your damnable editors dared to use that image montage. You should be (and hopefully will become) absolutely ashamed of your actions. I understand what you’re saying. I do not feel ashamed of the article I wrote — I think it makes an accurate presentation of your views and suggests that you could do more to discourage anti-Semitism among your more extreme followers. This article was meant to showcase your views on the Holocaust and anti-Semitism. If you feel that it has misrepresented your positions, I encourage you to write a response and our editors will gladly put it on the site. If you want instead to write a blog post on your own site, I bet we would link to it on our site. My editor’s name is Helen Chernikoff, and her email address, if you want to write a response, is [email redacted]. I understand from Ari Feldman that you acted as editor on the article he wrote (purporting to be about me). Did it ever cross your mind that juxtaposing a picture of Hitler with me risks diluting the not-to-be-trifled-with menace of the former as much as it sullies my reputation? Don’t you think that it is your sacred responsibility, given the horrors of Hitler’s actions, to avoid such casual comparisons at all costs, lest you degrade the utility of their use in a true emergency? Can’t you see that the use of such imagery to sensationalize and attract readership does a truly sinful disservice to those who died so terribly and in such numbers at the hands of that demagogue? You should be utterly ashamed of your actions and your decisions, you should beware of the future actions and essential motivations of your “journalist” (as his a priori prejudices and carelessness are likely to get you in real trouble), and you should apologize in print without reservation for your handling of this situation and for Feldman’s behavior. You imagined an enemy where in truth you had only a friend. Print all that, if you dare. Thank you very much for writing to me, as Ari’s editor. We are changing the photo. I will also state right away that Ari had only the right intentions and motivations in writing his article. As of now (morning in the UK on May 14), Forward has in fact changed the picture (although the rest of the article is as of now intact). You can draw your own conclusions from that. We’ll see what happens next. I’ll update this post if events necessitate that update. Thank you again for your message. I believe we made an error in publishing your piece with the art that you object to. 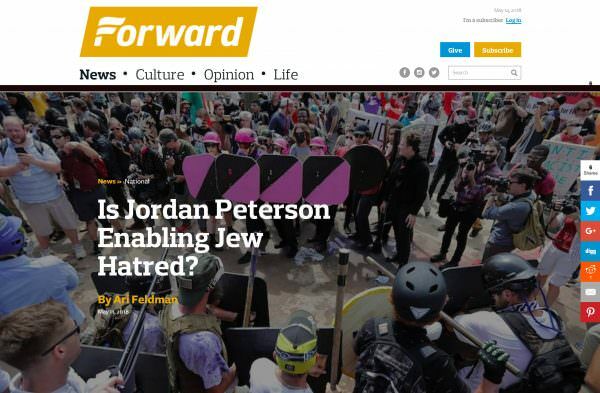 It was not our intention to equate you in any way with Hitler — the article makes it clear that you are not an anti-Semite, and that you believe that in your work you are battling anti-Semitism. The art was meant to convey your intense engagement with Hitler and the Holocaust, also testified to in the article. However, we obviously did not communicate that. What’s more, as you say, the juxtaposition was potentially damaging and dangerous. We have changed the art and apologized in the article for the original illustration. Lipstadt said that Peterson’s statements on Jewish intelligence reminded her of Kevin MacDonald, a professor of psychology who the Southern Poverty Law Center has [described](https://www.splcenter.org/fighting-hate/extremist-files/individual/kevin-macdonald) as “the neo-Nazi movement’s favorite academic.” MacDonald has written several books criticizing Jewish intellectual culture. (Peterson links to a critique of one of MacDonald’s books at the end of his blog post on Jewish intelligence.) Lipstadt said that MacDonald’s academic language obscures the anti-Semitism behind his opinions. She worries the same is true of Peterson. There are several other points in the article which give the lie to your accusation of malign intent. This was not a hit piece. It was a sincere attempt to grapple with a powerful cultural phenomenon — you — and the potential impact of your words on a minority community — us — at a time of heightened tension and sensitivity around anti-Semitism — now. I have reached out to our opinion editor, Batya Ungar-Sargon, and she will be in touch shortly to formally invite you to write a response to Ari’s article, or on Jewish topics in general. At the Forward, we seek a broad range of perspectives, as exemplified by Cathy Young’s piece about you, published yesterday.